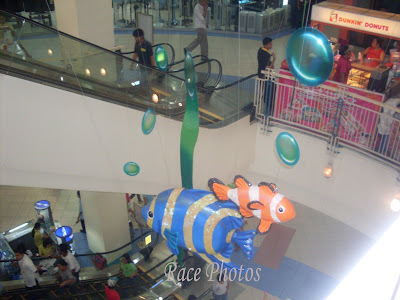 I find this hanging fish decor cute when we dropped by to let the kids play at the arcade in Robinson's. Well I didn't passed the chance to take some shots and the guard at the mall upon seeing my two flashes of shots asked what's my photos for. I told him that it's only for my personal use and he told me that they don't allow anyone to take a shot of their mall decor. Oh well I laughed inside because it's my 2nd time to be noticed by mall security-the first was in SM North Edsa. I noticed that there are some foreigners with cams who had their shots too. I was thinking if they didn't see the foreigners or they can't warned them lol! For blue monday and wordless wednesday pics pls click on the badge at the top! I am always stopped from taking photos inside coffee shops and outside store windows too but the tourists are not. Glad you were able to save your blue fish lol. How strange that guards would prevent anyone from taking pictures! I'm glad you shared. Happy Blue Monday. I can see no harm in taking pictures of something like this. With the worldy problems we are having now, guess they even check out arcades. Glad you only got a warning. Cute fish. I believe the guards are suspicious of everyone nowadays. Hmmm thats pretty unusual! Guards disallowing you from taking photos inside the mall.. hmmm! Cute photo... glad they didn't take your camera!